Tim Hortons' cup in Halifax. Photo by Sue Frause. The Tim Hortons chain was founded in 1964 in Hamilton, Ontario by Canadian hockey player Miles Gilbert "Tim" Horton. Back then, it was all about donuts and coffee, and their specialties were two original creations -- the Apple Fritter and the Dutchie. They're still two of the most popular items today. My favorite is the Timbit, a little bite-sized donut hole, available in more than 15 varieties. Today's menu features everything from coffee and donuts to soupsand wraps. Recently, I had a hot chicken club sandwich at the Vancouver International Airport, en route from Montreal to Seattle. Not bad! Tim Hortons has twice as many Canadian outlets (2,733) as McDonald's. But they're headin' south. In 1995 they merged with Wendy's and are now in the eastern US, with 345 locations south of the 49th Parallel. 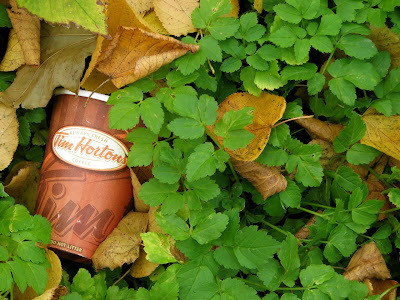 For me, Tim Hortons is pure Canadian.